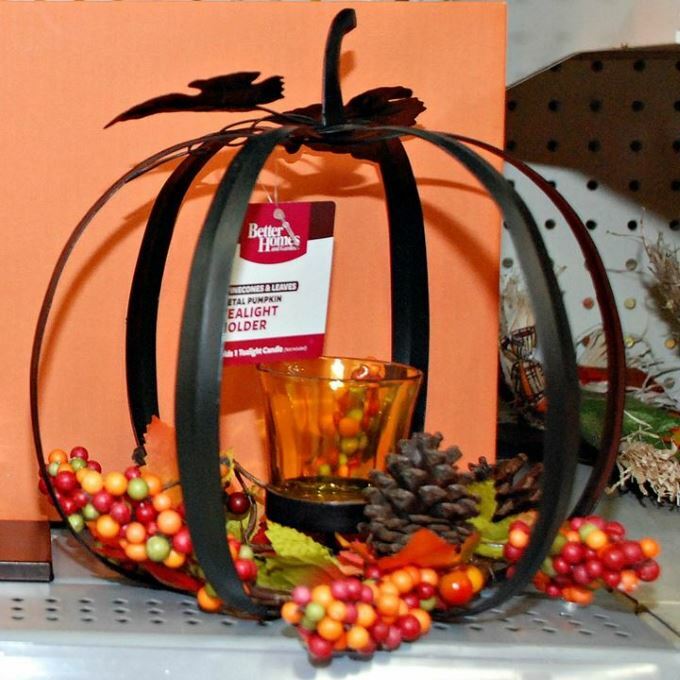 Can you ever have enough pumpkins in the house when decorating for fall? Uh, no. You even need them out on your front porch, right? Of course! In the bathrooms too! 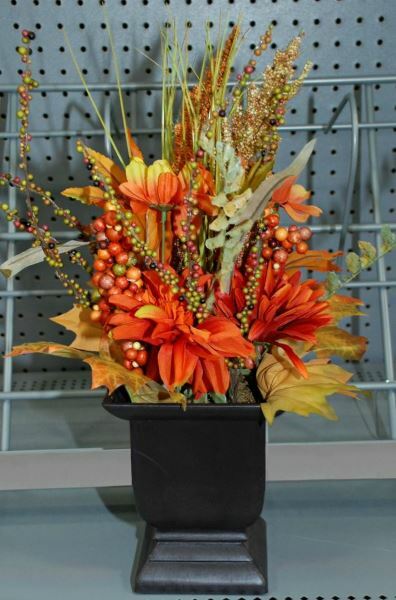 They’re such an easy way to sprinkle fall around your house. These pumpkins caught my eye right away. They come in green and dark orange too. The one on the left is about six inches tall. I love the pretty iridescent glitter on them. 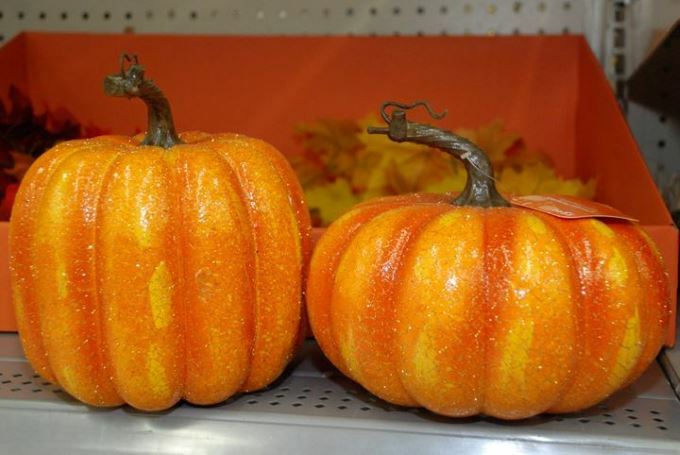 If Cinderella could buy pumpkins at Walmart she’d go straight for these. There were lots of different kinds of these potted faux flowers. Very nicely done and just the right size. It looks serious in that pot – but trust me, this brings such warmth and love into a room. The colors are so vibrant. 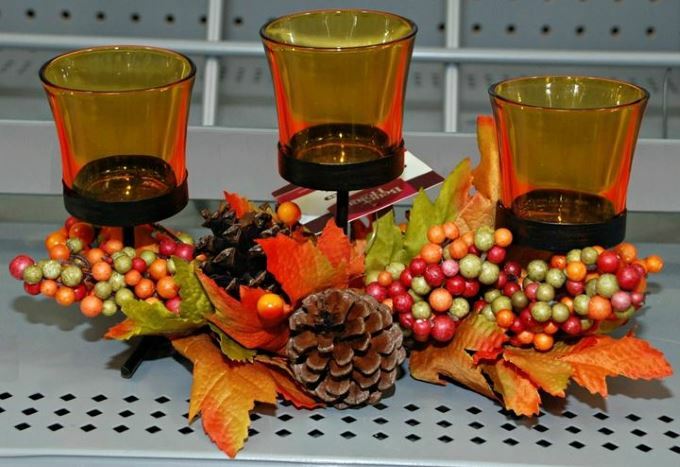 This would be absolutely lovely with candles burning in the middle of the dining room table at Thanksgiving. Yeah, I know, would be lovely. Of course, I wouldn’t have anything with a real flame on my table until my boys were oh, about 30 years old. This pumpkin is about 7 inches tall. It has small and delicate lights through it. It has a battery pack for either AA or AAA in the back. I’m sure it’s stunning when the lights are on. I have to mention the type of batteries because I’m completely over and done with cell batteries. I don’t know why they don’t sell cell (are you ok?, sorry, untwist your tongue) batteries that come in a vitamin-size bottle, at a low price, and with ONE number on it that is universally used. AAAGH! Ok, I’m calm now. Thank heavens this beautiful pumpkin does NOT use cell batteries. This metal pumpkin is about 8 inches tall. It would also be pretty on the table at Thanksgiving. You can maneuver the foliage around to your liking because they are on wires. I could swear I saw one that was gold drive off in someone’s cart. Of course, I looked around and there weren’t any more gold ones. Drats when that happens. 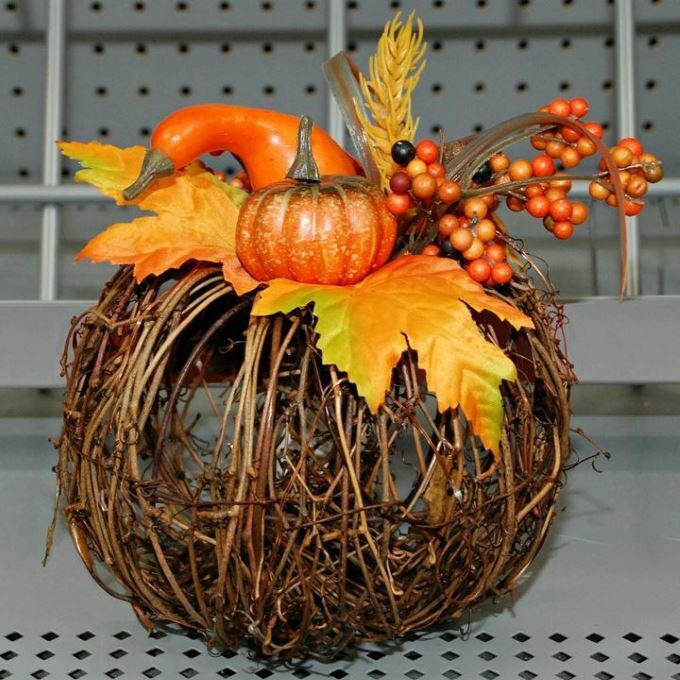 BUT when I was driving around, people sure were checking out all this beautiful fall décor in my cart. So, back at you babe.